Sandrock Elementary second grader, Robert Schmidt, reaches down to pet Jerry, a golden doodle certified therapy dog as classmate Avery Chadd looks on. The students sat during a presentation on service and therapy dogs by Shannan Koucherik. Koucherik joked about Jerry's tough job as a therapy dog having to be pet all day. 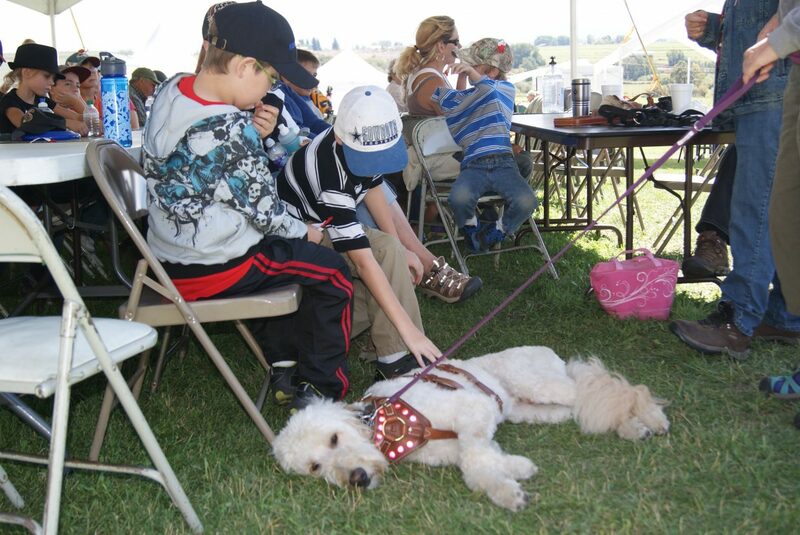 Craig second graders found out what hands on learning meant while attending the Meeker Classic Sheepdog Championship Trials throughout the week of September 5th. Students had the opportunity to watch border collies compete in herding sheep, learn about service and therapy dogs, visit a petting zoo and watch an agility demonstration. Teachers said they took their classes on the field trip because it ties into their curriculum and meets state science standards. Shawn Steele, second grade teacher at Sandrock Elementary said the trip ties directly into the state’s science component about humans and animals interacting with one another. “The kids are excited for the new experience. Even though it is part of our community, the event offers things they still haven’t experienced,” Steele said. Michele Conroy, also a second grade teacher at Sandrock, said students learned that life has rules. Just like the dogs had to follow rules to win, students have to follow rules in different situations too. The students will attend Craig Sheep Wagon Days next week and have another opportunity to see interactions with animals, including sheep shearing. And although they did learn, “service dogs help people if they’re blind or can’t hear,” said second grader Forrest Siminoe. “Oh, and you can’t pet them.” They also had fun. Students visited the petting zoo and fed horses and a donkey, then preceded to watch a border collie agility demonstration where they oohed and ahhed over the feats performed. “The trip lets students relate to our community and culture,” Steele said. Learning about all types of working animals, the students met a golden doodle, Jerry, a certified therapy dog and Mik, the border collie, in a presentation on service and therapy dogs. Shannan Koucherik, who gave the presentation said educating children about service and therapy dogs is essential for a couple of reasons. “It’s important that they understand the dogs can do a variety of tasks to make human life better, and also that they deserve a lot of respect when they’re out and about,” Koucherik said.